Frame, new background and 3D effect for a realistic Gallery Style. 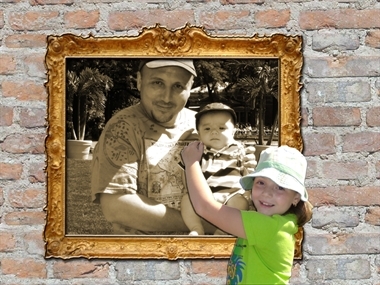 The original photo is divided: part of the picture (digital frame applied) becomes a picture on the wall, and the second part of the picture, is taken "outside" of itself, for a 3D impression. Adjusting tones & colors effect is applied to one of these two parts to make a difference between them. Best pictures for this effect (as showed here) are those where the main subjects are positioned in two different planes, if possible in motion, but the picture still needs to be sharp, vivid, clearly defined objects with a good balance of colors, proper lighting and exposure. The picture also needs to has some perspective and to be focused on the main subjects.